Recently, I have been trying to cut back on my shopping (you can probably guess how that's going) and I have been trying to style more pieces that I already own instead of adding more to the collection. Sweaters are my favorite thing to wear during the colder months but after a while wearing plain jeans and a sweater starts to get a little old. I purchased this cute pink sweater from H&M a couple of years ago and I love how versatile it is. 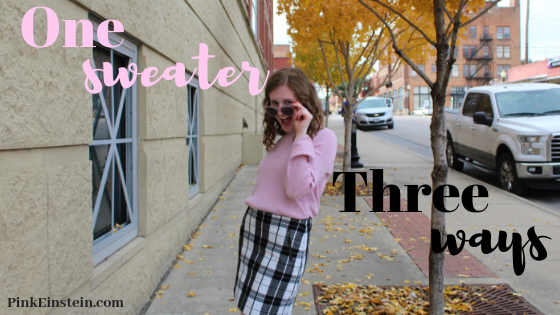 I came up with a few different ways to style this sweater in case you too are in need of some sweater weather outfit inspiration. Scarves have been my new favorite thing! I love to tie little scarves like this in my hair and around my neck and I think they can make an outfit look so much more fun. I paired the pink sweater with a zebra print scarf (it's very old and I have no idea where its from), jeans, and brown riding boots. Athleisure is so popular right now and I love the idea of looking cute while still being able to wear comfortable shoes. I paired the pink sweater with light wash cropped jeans and gray New Balance tennis shoes. We all know that I love to get dressed up so this outfit is probably my favorite of the three. I paired the pink sweater with a black and white plaid skirt and my favorite Target mules. I hope this gave you a couple of ideas on the different ways you can wear your sweaters this winter.